INDIAN RIVER COUNTY SHERIFF’S OFFICE SPECIAL DEPUTY MICHAEL HYDE arrived spontaneously, unannounced, at the Indian River County Sheriff’s Office on the morning of September 11, 2015 to honor the memory of those lives lost on September 11th, 2001. All of the employees of the Sheriff’s Office were notified of his appearance and told they could come outside to pay tribute to those lives lost and experience Deputy Hyde play “Amazing Grace,” one of the most recognizable songs in the English-speaking world. From there, he randomly toured the County playing Amazing Grace at multiple locations. 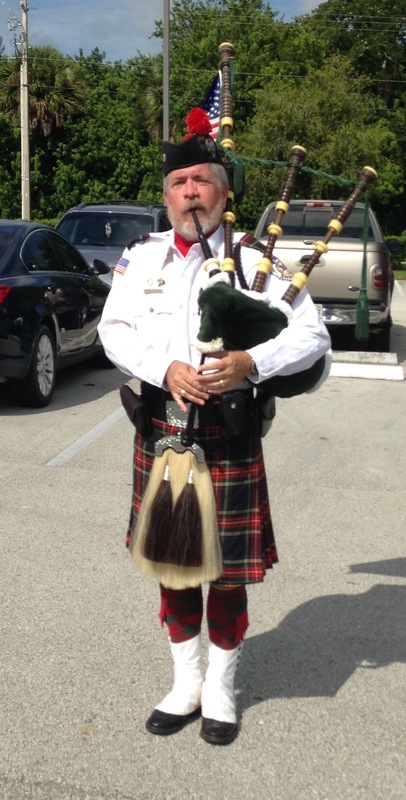 Deputy Hyde plays at funerals and memorial services, weddings, golf and country club events, parades, military functions and special church events. HIs primary instrument is the Great Highland Bagpipe, meant to be played outdoors or in large buildings. How big is this man’s heart? A true American displaying the American way of life ! Way to go Michael, You,re as handsome as ever. Hope to hear you perform someday.